After a long day in the workshop whether you are a professional or amateur, it is very common to acquire aches and pains. Some of these can be remedied by a hot bath and good nightâ€™s sleep, but over time others can become chronic and lead to repetitive strain injuries, joint pain and disc degeneration of the spine. 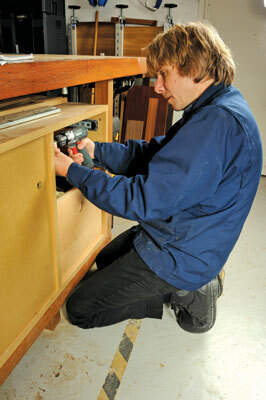 A study of the woodworking industry found that over 40% of a woodworkerâ€™s day involves lifting and handling. The same study discovered that woodworkers spend 25% of their time with a twisted/bent back and another 25% with extended arms. These awkward work postures can lead to a host of acute and chronic physical problems. The good news is a lot of these bad practices can often be avoided. 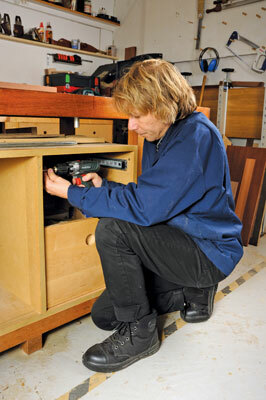 In this article registered osteopath Michael Pearce, who enjoys a little woodwork himself in his spare time, looks at some of the postural pitfalls which can lead to pain and injury in the workshop and suggests ways to avoid injury with good ergonomic practices. When lifting, get as close to the object as possible. 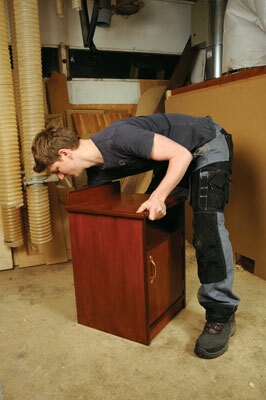 If the object is too heavy then ask for assistance or use lifting equipment if available. Spread your arms around the load so it is well supported. Bend your knees and gently tighten your lower abdominal muscles; this gives your lower back support. Establish a wide, stable base with your feet, and slowly exhale whilst lifting using your powerful leg muscles. If possible, raise the load in stages from one platform to a slightly higher one. Repeat this procedure in reverse when you are lowering the load. The repetitive use of one joint is never ideal. It can lead to pain and dysfunction from tendonitis and repetitive strain-type injuries. 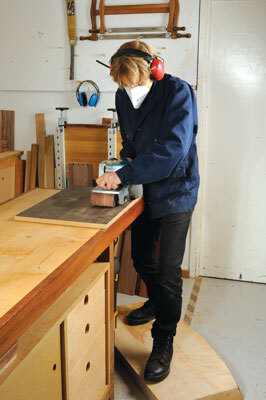 However, sometimes a task like sawing requires this overworking of the shoulder joint. To minimise the impact on the shoulder and the upper limb in general, whether working on a saw horse or standing at a workbench, make sure your arm works like a piston. The arm should also remain close to the body during the action. Spread your weight evenly between feet or hands, knees and feet in the case of the saw horse position and of course make sure you use a sharp saw! 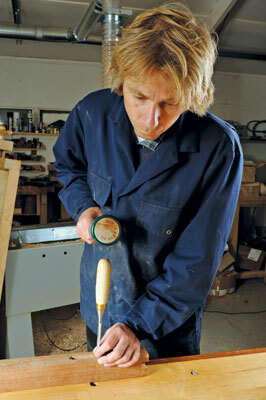 Make sure the workbench is the right height, about the level of your buttock crease. 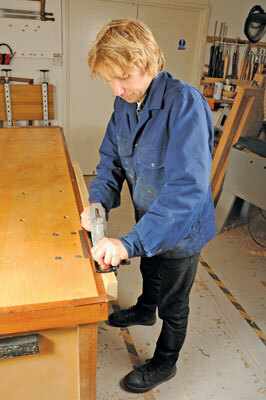 In the photos Derek has utilised a wooden platform to make the working height correct. This enables you to work with slightly bent knees, and so allowing the power to come from the legs, not the arms, which tire much more easily. 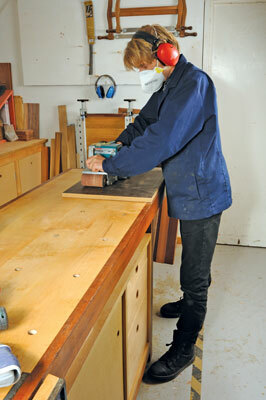 When sanding, get your body weight over the sander and move your body with the sander, shifting your weight from the back leg to the front leg. 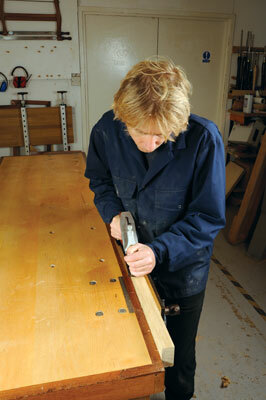 Stand facing the direction of the sanderâ€™s movement, not perpendicular to it. The same rules apply here as with the sander. 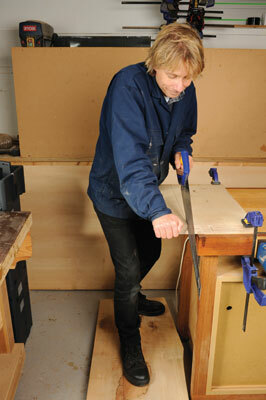 Check the workbench height, shift your weight from the back foot to the front foot with slightly bent knees. Face the direction of the planeâ€™s movement and stand behind the plane. Move your whole body with the plane, not just the arms and again make sure your blade is sharp. When working in an awkward position, try to keep the body working as a unit. Keep your elbow at your side and use your body weight to assist in the operations of drilling and screwing; do not just rely upon your shoulder muscles. This will be assisted by facing the task. 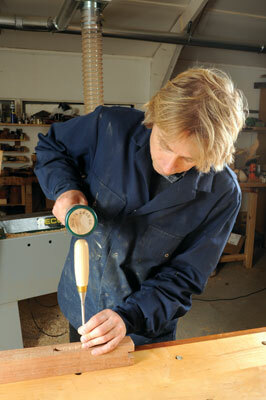 As with sawing, it can be necessary when chiselling to overwork one limb. The important thing is to apply the general principles. 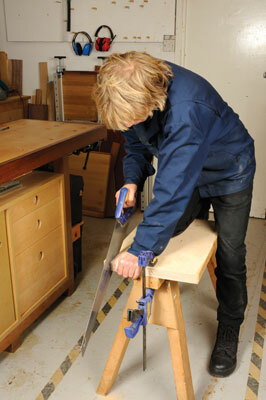 Bench height, keep the operating arm close to the body and get your body weight over the tool. As well as thinking about your posture when you are working and doing exercises when you are feeling stiff, try to vary your tasks in the workshop. Donâ€™t saw for hours and then sand for hours â€“ mix it up! This avoids overuse and fatigue of muscles not only of the operating arm but also of the associated postural muscles. By paying attention to posture and developing good ergonomics in the workshop you should be able to work for longer, be more productive and work with more comfort. However, there is no remedy I can offer for a hammer to the thumb!